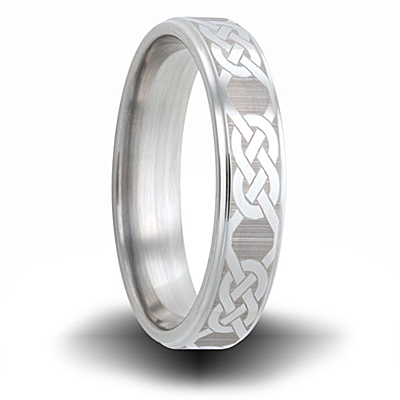 Knot pattern titanium ring has step down edges. Laser engraved design. Width: 6mm. Deluxe comfort fit. Enjoy manufacturer's lifetime warranty for re-sizing and re-furbishing. Made of aircraft grade titanium in the USA. These rings were an excellent choice. We both love them. The rings are very comfortable to wear and look great on.